The Diner Shiner’s unique profile and detail make this one of the most realistic baitfish imitations on the market with the added benefit of a stainless steel wire keeper. 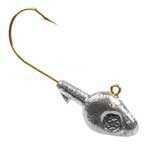 Can be made without the wire keeper, see minnow category for pricing without the keeper. It has a recessed eye socket for glue on 3D eyes. 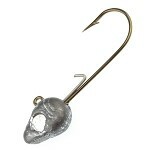 This is a great jig head for casting or trolling for panfish and walleye or as swimbait or A rig jig for bass. A size #2 eye fits 1/16 -1/4 and a size 2.5 fits 5/16 and 3/8. DINER SHINER with WIREKEEPER PAINTED-1/16-1/8-3/16 Minnow Head Painted with eyes - 1/48 - 1/32 - 1/16 - 1/8oz.